AERA secured travel discounts with several companies to aid your participation in the 2019 AERA Annual Meeting. Please reach out to the companies directly if you have any questions about the discounts. 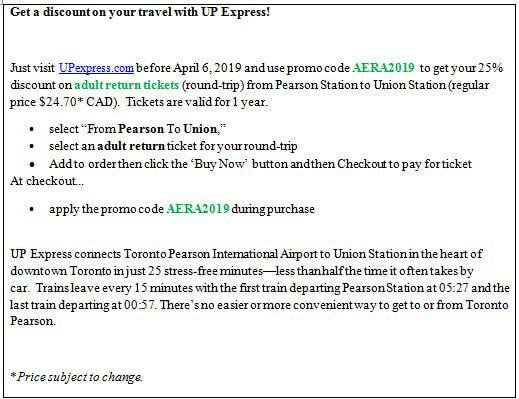 The discount codes and numbers are only valid for the 2019 AERA Annual Meeting, and discounts will only apply to Toronto Pearson International Airport three days pre and post meeting (March 31, 2019 – April 14, 2019). Toronto Pearson International Airport (YYZ) is Canada’s primary airport with travel connections to every continent and also ranks among the top 30 world airports for passenger traffic and aircraft movement. Travel easily from Toronto Pearson to the downtown core in less than 25 minutes with the UP Express train that connects to Union Station: upexpress.com. AERA is working to get a discounted rate for our attendees to travel on the UP Express train. https://www.united.com/web/en-US/apps/booking/specials/meetings/default.aspx using ZCODE: ZFZ6 and Agreement Code 750546 or call United Reservations Meetings Desk at 800-426-1122 and provide the Z Code and Agreement Code. Book online at www.delta.com/meetings and provide the Meeting Code NMSNF, or call Delta reservation Desk at 800-328-1111 and provide the Meeting Code. Toronto is served by VIA Rail, which provides connections to many Canadian cities. It is also connected to the Amtrak system through Niagara Falls, N.Y. If you travel by rail, you will arrive at Union Station, located three blocks from the Metro Toronto Convention Centre. By far the fastest, but also the most expensive: fixed fare, about CAD55, tax included, but excluding tip. Major credit cards are accepted. The trip will take 20-30 minutes (possibly more if travelling during peak times). You have the option of “limos” and “taxis.” A taxi is recommended; the limos are more expensive with only a marginal upgrade in car quality not worth the extra price. Airport Express is a private bus company offering door-to-door service to/from many downtown hotels directly to/from the airport. Service departs every 30 minutes, starting from 05:00 and ending at 23:00. Fare is CAD26.50. Please reach out to the companies directly if you have any questions about the discounts.